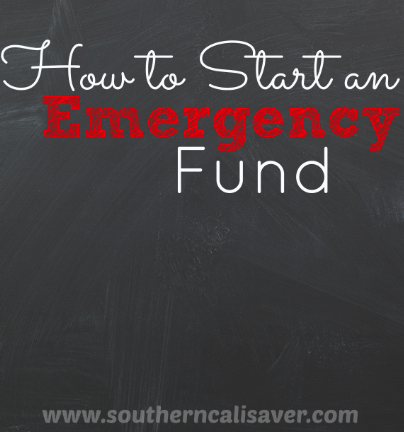 If you are like most people and live from paycheck to paycheck, you probably wonder how you could possibly manage to learn how to make an emergency fund on your income. The irony is that because of your financial status, you probably need an emergency fund more than someone who has more money. Why? Because if you don’t have one, an emergency could wipe you out and leave you wondering how you are going to pay your current bills. People in a higher income bracket have a bit more cushion. Figure out how much: Decide how much you want in your emergency fund and how much you can put in each month. Then, determine how long it will take to reach your goal based on your monthly contribution. Ask your bank for help. Banks often have programs just to help you save up some money when you don’t think you have money to save. For example, some banks offer change transfer programs. When you spend money out of your checking account, the change gets transferred to your savings account. That means if you use your debit card to pay for an $.89 candy bar, $.11 goes into your checking account. You never miss it and it makes balancing the checkbook much easier, but that change adds up fast. Turn your hobby into a side job. You probably have some skill in an area other than the one you are employed in. Maybe you like to paint or make jewelry. Keep your regular job, but start selling your projects or services that you do on the side. The money from your side job goes straight into the emergency fund so you don’t spend it. You still have the same income from your normal job, but now you have some extra income to put into the emergency fund. Recycle. There is some money to be made recycling and it doesn’t take a lot of effort. You can collect metal and sell it to your nearest recycling facility. Aluminum cans are probably the most well known items to be recycled, but you recycle any kind of metal. Cat food cans, vegetable cans, old nuts and bolts, and just about anything else that is metal has some monetary value. You can even look for items to pick up around your neighborhood. The money that you make from recycling can go into your emergency fund. You’ll be taking control of your finances and reducing your carbon footprint on the planet at the same time. Participate in the 52 week Money challenge. Save small amounts each week and watch it add up! You will be surprised as to how much you can save in one year– the 52 week money challenge guarantees $1,378 if followed each week. Have it taken out of your paychecks: If your employer allows direct deposit–they may give you an option of depositing into two bank accounts. Have a set amount taken out each paycheck which can be sent to a separate bank account. Usually, the “out of sight out of mind” technique works well. Learning how to make an emergency fund is really learning how to manage your money more efficiently. You may need to scale back on some of your expenses like cable or cell phone bills. You may need to find ways to add to your income. Everyone should have a good-sized emergency fund, but keep in mind that if you only get to put a few dollars away at a time, it’s still more than you were putting away before. Challenge for this week: Start small and find extra money to put away for a emergency fund. If you don’t have a lot, start with finding ways to cut your monthly expenses and put that extra savings into a account. If you have extra money, and direct deposit with your employer– have a select amount taken out each paycheck and LEAVE it! Lets say you make $1000 a paycheck and you can afford $20 taken out each paycheck. After a few weeks, you will have adjusted to getting just $980 each paycheck and will soon forget that you are even missing that extra $20. Check back next week for learning how to budget on a irregular income! You can also have a yard sale or sell things on Craigslist and put it all towards your emergency fund!